Semi-urban and mid-rung schools are India’s ‘greenest’. New Delhi, February 20, 2010: India’s schools and their students are doing a lot for the environment, but the real action is not happening in the ‘elite’, big-budget, up-market schools. Rather, semi-urban and mid-rung institutions are leading from the front. They are the real changemakers, concludes an annual environmental audit of schools that Centre for Science and Environment (CSE) directs. Based on this environmental audit, CSE confers the Green Schools Awards to those schools which excel in their natural resource management. The 2009 Awards were given away here today by Shiela Dikshit, chief minister of Delhi and Sharmila Tagore, film personality and chairperson of the Central Board of Film Certification. The awards are being given out since 2006 under CSE’s Green Schools Programme (GSP). Under this programme, schools across India carry out rigorous self-audit on environmental practices within their own premises, following a set of guidelines issued by CSE (see attached material or the website for details). Among this year’s winners are the DAV Public School (Thermal Colony) of Panipat (Haryana); Anubhuti School from Jalgaon (Maharashtra); and St George’s School at Alaknanda in Delhi. “About 5,000 schools from all over India have participated in the programme this year. The 20 ‘greenest’ of them have been awarded here today. Also, the ceremony this year is being held in collaboration with the state government of Delhi, and the winner in the capital has been given a Chief Minister’s Rolling Trophy. 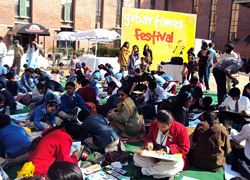 Ten schools from Delhi had been shortlisted for the honour,” says Sumita Dasgupta, coordinator of the programme. Accordingly, the awards have been divided into two main categories – national and state. The 20 national awards have been further sub-divided into two segments of 10 awards each – the new schools (those which have done the audit for the first time and have excelled) and changemakers (those which have already done the audit once before and continue to excel). Of the 20 national toppers this year, nine belong to the semi-urban, mid-rung category. These include institutions such as a government secondary school in Reshi, Sikkim; a government girl’s school from Dakha in Ludhiana, Punjab; and Jawahar Navodaya Vidyalayas from Prakasam and Adilabad in Andhra Pradesh. Six of the national-level winners are from Delhi (see attached winners’ list). “What is interesting is that in Delhi, some of the ‘elite’ schools do join our programme with great fanfare, but fail to carry it through. In 2006, for instance, 60 per cent of the capital’s so-called top-bracket schools participated in the programme, but none could break through into the top ranks. Their resource consumption rate was disproportionately high compared to their conservation initiatives. It’s the same story this year,” says Dasgupta. Most of these schools resort to token programmes and gestures like eco-clubs, eco-tours, vermicomposting etc, without generating any real long-term impacts, says Ashish Shah, deputy coordinator, GSP. Compared to this, mid-rung schools have participated in large numbers every year and swept the awards. Almost 60-70 per cent of them repeat the audit every year, improving on their performance each time. Some, like Salwan Public School in Gurgaon, have registered impressive changes in mobility practices – discarding personal transport (cars) for commuting in favour of walking and cycling. “These schools, because of their commitment and persistence, are the ones that are really making the difference,” says Dasgupta. Among the key innovators, mention must be made of St George’s School from Delhi, which has bagged the top state-level prize, for its exemplary water management practices. The school reuses all its grey water to irrigate its playfields and green areas, and has a rainwater harvesting system with a 100 per cent harvesting capacity. The Government Girl’s School in Port Blair (Andaman and Nicobar Islands) has been judged the best waste manager: it recycles 95 per cent of its solid wastes and conducts awareness campaigns among the region’s hotels (as tourism is the single largest source of waste generation in Port Blair). Deepalaya, a Kalkaji (Delhi)-based school for underprivileged students has earned kudos for its balanced land-use policy. Another winner in this segment has been the Government Primary School of Machakimalsingh in Ludhiana – a rural school, it has turned its grounds into a biodiversity hotspot with 67 varieties of medicinal plants! Jalgaon’s Anubhuti School sources almost 15 per cent of its energy from solar power, using it for water heaters, street lights and cooking. The DAV Public School of Panipat stands out for its all-round effort to ensure wise-use of natural resources. It treats 100 per cent of its wastewater, harvests 80 per cent of rainwater, and ensures that the emission levels of the vehicles plying within its premises are minimal. “All the shortlisted schools this year have shown exemplary performance in terms of managing their water, wastes and mobility. Hopefully, this recognition of their efforts will help highlight the distinction between real and token action, and encourage other schools to actually design actions to make change,” says Dasgupta. For more details, you can contact Sumita Dasgupta (sumita@cseindia.org) on 9811406403 or Souparno Banerjee (souparno@cseindia.org) on 9910864339. If you wish to interview the award winners, please get in touch with Souparno Banerjee (souparno@cseindia.org) on 9910864339.